Art West 45 is a broad-based comprehensive arts program open to students in grades 10-12 with a strong interest in visual arts and design. Students who want to push themselves in the visual arts further than they would in a regular art class, or those who just enjoy creating various types of art, will benefit from this vibrant, enriched program. 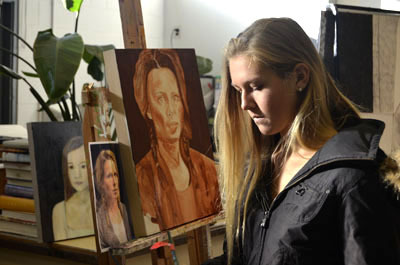 Students spend 1-3 blocks of one day in the studio, allowing them to pursue more advanced art techniques and uninterrupted creative time, including work with life models. Original work may be used to build a strong personal portfolio for post-secondary education opportunities and employment following graduation. 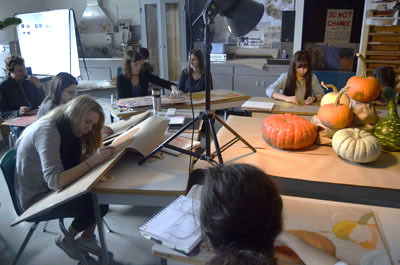 Students receive up to 16 credits towards graduation, along with the opportunity to develop connections through community galleries, studios and businesses. During the 2016-17 school year, Art West students received federal and local grants to collaborate and visit with the Gitga’at Nation from Hartley Bay, BC to create a mural in celebration of Canada’s 150th birthday. The mural will address connections to community lands and personal cultural identities. Students will have the opportunity to exhibit the work at the Museum of Northern BC, the West Vancouver Museum, and the Harmony Arts Festival. For more information, please contact Jackie Wong.